Last weekend, my wife decided to give a treat to our three kids. Yup, McDonald Happy Meal is considered a treat in this part of the world. The next morning when I got downstairs, I found a three bedroom house with a pool made out of the happy meals. LOL... after they were finished with the meals, with cellophane tapes and a scissor as their tools they went to work. 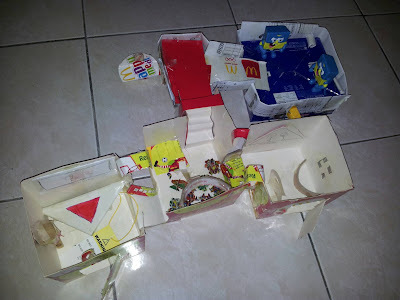 I have always encouraged them to be creative and this is just one of their many projects.